Momoko Hayakawa is a research associate with the Human Capital Research Collaborative at the University of Minnesota. Arthur Reynolds is a professor in the Institute of Child Development and co-director of the Human Capital Research Collaborative at the University of Minnesota. 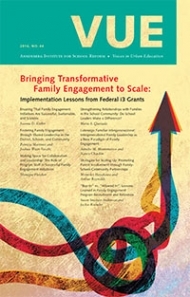 Flexibility, creativity, and collaboration are required to successfully meet the needs of each school when scaling up family engagement programs across a diverse range of communities. Are you interested in participating in a healthy cooking workshop? Are you interested in participating in a “Real Men Read” event with your child at the school? Are you interested in reading to your child’s class? Parents are often asked at the beginning of the school year whether they would be willing to volunteer their time or participate in various events offered at the school. Parents may express interest in participating in these events, but to the teacher’s chagrin, low parent turnout is unfortunately a frequent reality. It is all too common to hear from teachers that demanding and busy life schedules prevent parents from following through in their commitment to participating at school events. In our work implementing the Child-Parent Center Preschool to Third Grade (CPC P-3) program, we have encountered a variety of barriers, but also have developed strategies to overcome these challenges. As intervention researchers and implementers of the Midwest expansion of CPC P-3, we have worked with schools across diverse demographics and have identified some major barriers frequently experienced by schools. Through close collaboration with teachers, social workers, administrative support, and school staff, we have surveyed numerous public schools on feedback they have received from parents on the challenges of participating in school events. Scaling up our program across diverse communities in the Midwest has required flexibility and collaboration to build strong family-school-community partnerships, allowing schools to adapt components of our program to fit their needs, engaging with schoolbased collaborative leadership teams, and creating dedicated physical space for parents to feel welcome. Established in 1967 and initially implemented in Chicago, the Child-Parent Center (CPC) is a center-based early intervention that provides comprehensive educational and family-support services to economically disadvantaged families from preschool through third grade. Each CPC is located within or near an elementary school building. Receiving a federal Investing in Innovation (i3) grant in 2012 allowed us to further expand the CPC P-3 model across thirty-seven schools in four urban and suburban communities of various sizes in Illinois and Minnesota. Ensure mastery in language and literacy, math, science, and social-emotional development throughout early childhood. Organize a sequence of evidence-based curricula and instructional practices that address multiple domains of child development within a balanced, activity-based approach. Comprehensive services are led by the parent resource teachers and school-community representatives, including multifaceted activities and opportunities to engage families. A leadership team (parent resource teacher, school-community representative, curriculum alignment liaison, and parent liaison) is run by a head teacher in collaboration with the principal and assistant principal. Preschool to school-age continuity, through co-located or close-by centers, incorporates comprehensive service delivery and stability for children and families. Online professional development and on-site follow-up support is integrated for classroom and program applications. The integration of these elements across the entire early childhood period distinguishes the CPC P-3 program from other approaches, which may include specific initiatives such as professional development or instructional enhancements but do not usually lead to strong and sustained gains in student learning. Because of the comprehensive scope of the elements, the CPC program seeks to enhance the culture of learning in the school, which makes it a school reform model, and our research has found large and sustained gains in student achievement and parent involvement (Reynolds, Ou & Topitzes 2004; Reynolds et al. 2011; Reynolds et al. 2002). While all six elements work in tandem and are essential to the model, a unique and critical aspect of the CPC P-3 program is the parent involvement and engagement component, which has been successfully implemented across diverse communities. This menu-based system is made possible through our parent involvement system, which requires the following steps to implement a successfully tailored parent program. 1. Family Needs Assessment, which inquires about family needs and interests as well as times available for in-school activities, and provides an opportunity for families to describe needs for social services. School staff work collaboratively to administer the family needs assessment at the beginning of each year and use this information to determine what types of activities to include and how best to deliver them. 2. Asset Mapping, a process of gathering formal and informal information about resources available in the school and neighborhood community, which can be used to further develop partnerships and the sharing of resources between the school and community partners. 3. Parent Involvement Plan is developed by the parent involvement and engagement staff, based on the results of the needs assessment and asset mapping. 4. Monthly Parent Involvement Calendar, which lists the time and day when an event or activity is occurring for a particular month. At the end of each month, based on the parent involvement plan, school staff meet with families to brainstorm and develop events and activities of interest to families for the upcoming month. The activities provided by the school vary each month based on the families’ interests and themes covered in the curriculum. The parent involvement calendar is approved by the principal and distributed to all families on the last day of each month. 5. Parent Involvement Log, maintained by each site to document the frequency of attendance of events, including the event type, time, duration, and who participated. This allows parent involvement and engagement staff to understand and tailor parent programming in subsequent months to ensure an effective and successful program. Parent involvement and engagement staff work collaboratively with parents to develop events and workshops for families from a list of broad categories. The program maintains high fidelity while simultaneously featuring tailoring by ensuring customized events and workshops based on individual school’s needs assessments, but offering at least one event or workshop from every parent involvement category. Thus, the frequency of events from each category differs by each school – some schools may have weekly nutrition classes while others have weekly GED workshops – but all families are presented with a menu of options. In this way, we have been able to implement our parent involvement and engagement program across a diverse range of communities. The tailored, menu-based approach is integral to a successful CPC parent program with high levels of school-based parent involvement and engagement. Physical participation in events, activities, and workshops held at the school is emphasized based on previous CPC research that has shown that frequency of attendance is associated with children’s achievement (Miedel & Reynolds 1999). Recent research has shown that school-parent involvement, within the context of the CPC program, increases student motivation, which then increases achievement and later student motivation, as well as subsequent school-parent involvement (Hayakawa et al. 2013). As a result, the CPC program emphasizes parent involvement and engagement as a critical element that must be implemented successfully and tailored appropriately to reflect the needs of each school-family- community. The flexibility and individualized approach to the parent involvement program has allowed schools to creatively adapt their program to their families’ needs and interests. One inner-city school with a predominantly Latino population found through their needs assessment that families were most interested in health events; families were attending healthy cooking classes, Zumba classes, and walking groups, but there was consistently low attendance in workshops on child development and literacy. Since parent participation data is meticulously collected as part of the CPC program, parent involvement staff recognized the popularity of Zumba classes and decided to attach a literacy component to them: parents would come to participate in the popular Zumba class and stay for a literacy workshop. In this case, the key to parents’ attendance was identifying an event that matched parents’ interests and motivated families to come to school. Furthermore, once families felt welcome and comfortable in the schools, they continued to participate in other events that they had not attended at the beginning of the school year. If parents feel comfortable coming into the school, talking with their teachers and their principals, they’re going to feel connected to their child’s education. Therefore, they’ll stay involved all the way through elementary and high school. Our parents often feel they have nothing to contribute. We want parents to understand that they are the first teachers in their child’s life. Everything we do is geared to equip them for that role. So, being able to see what he was doing in the classroom, I could relate to it more and so we could bring that home also to be, like, “Oh, remember when this happened in the classroom?” or “I know you do this stuff in the classroom.” Because they would write a newsletter saying, like, we’re doing this stuff in the classroom, but actually being there and seeing – I felt like that was a tool for me at home as a parent to make it more seamless of a transition. Creativity is an important feature to the success of the PRT’s role. With limited dollars and resources, a PRT must develop events and workshops for families with different interests and needs. The success of the parent program hinges upon the PRT’s ability to address the needs, interests, and availability of the families. We have learned that these strategies can look very different, based on the particular school-community. In one of our schools with a high Hmong population, in a mid-size city, we found that providing a diverse set of events (e.g., personal development, health and safety, arts and crafts) on a daily basis was not addressing the interests of the families. As the PRT greeted families at the school gate and made phone calls to families to welcome them to the parent room and personally invite them to upcoming events, families stated that there were too many options and they were too busy. This resulted in no to low turnout at these events. The PRT worked with the SCR to understand what types of activities families were interested in and what times of the day would work best for them. By reviewing the data collected through the parent involvement log, the PRT was able to provide events that met the needs, interests, and schedules of families. For this particular site, the most effective approach was to provide one or two different events per week – focusing on child development, language, literacy, and math – in addition to one recurring monthly event. Furthermore, the PRT realized that afterschool literacy events in the evening and morning events with the principal had higher parent participation than events held during student pick-up time in the afternoon. However, in another urban school with a strong school-community culture, the success of the parent program hinged upon the variety and high frequency of events offered. In this school, two to three events were offered each day. Balancing a high demand for diverse events and workshops with a limited budget required the PRT to work with the SCR and reach out to community organizations and businesses that would provide workshops and resources for free. For example, they were able to form a connection with a local bakery that donated baked goods for parent involvement and engagement events. As the school was perceived as central to the community, local businesses were willing to donate materials and time; we received donated art supplies for parent craft events, and local business owners presented workshops to parents on how to write a resume, how to interview for a job, what to wear to a job interview, and how to start their own business. This community-building process takes time, as it is tied to the strength of the relationship between the school and the community, but it is made possible through the role of the SCR. The SCR is a paraprofessional who works with the PRT to implement the parent program and is hired because of his or her extensive knowledge of the local community and service agencies. Typical activities include recruiting and enrolling families in person and over the phone, providing resource referrals to parents, conducting home visits, and developing and strengthening relationships among the family, school, and communities. The School-Community Representative from Sugar Creek Child-Parent Center is interviewed about her strategies to engage families in their chilren's education. It’s all about the relationship. Without it, families will not open up about their real needs. Families need someone they can go to when in crisis, and I am happy that I can be available to point them in the right direction to find the assistance they need. Creativity and flexibility are key to an SCR’s ability to create a sense of welcome and trust within a school community. At one of our schools located in a suburb that draws students bussed in from rural regions, the SCR noticed that parents were simply not coming to school and attending any events. As the SCR was driving around in the school’s neighborhood, she soon realized that many parents worked at or spent time socializing at the neighborhood gasoline station. Seeing this as an opportunity, the SCR made frequent visits throughout the week to the gasoline station to meet families and establish her role as someone in both the school and neighborhood community. This provided her with an opportunity to get to know the families and gain the trust of the families. Once this relationship was established, she was able to provide home visits and welcome families to participate in school events and workshops. Another integral component to our successful parent program has been the availability of a physical space dedicated to welcoming parents: the Parent Resource Room. Located within each CPC and managed by the PRT, the Parent Resource Room provides a warm and friendly environment within the school, where parents can come in, learn, and become an active member of the school community. Any questions they have, anything we can help with, our doors are always open and we’re always available. We never turn anyone down when they come to us for help of any kind. . . . The workshops we offer are customized to their needs. If they need a job, we can help them with resumes and applications. If they need a place to wash their baby’s clothes, we invite them to use our washer and dryer. We encourage them to stop by the Parent Resource Room or come see me in my office any time to talk. I come to the workshops [at the center], and, you know, movie day, or game night. Stuff like that has helped me be more involved in [my son’s education], and learn how to create different activities for him to do. Whether they are here, there, or at home . . . coming to the events has showed me that I can still be a mother and have fun at the same time as interacting with him on a learning aspect. We are currently in our fourth year of implementing the CPC model across diverse populations in the Midwest. Our work underscores the importance for schools to collaborate with families and provide a variety of opportunities that reflect the needs of families from diverse backgrounds. This challenging but effective work is impossible to do well without dedicated staff. Our work highlights the importance of a full-time PPT dedicated to developing and maintaining strong parent involvement and a full-time SCR dedicated to connecting with families. As we have come across new barriers in scaling up our model, we have explored new strategies to overcome them. For example, in order to reach out to parents of children who are bussed to school, we have provided meet-and-greet teacher events in families’ home-communities and used text messaging to send parents reflection topics to work on at home with their children. We are continuing to learn each day and hope that as we expand our program, we continue to gain strategies that will help all schools in increasing their parent involvement and engagement for their families. For more on the Midwest expansion of the Child-Parent Center program, see http://humancapitalrc.org/midwestcpc. Hayakawa, M., M. M. Englund, M. N. Warner-Richter, and A. J. Reynolds. 2013. “Early Parent Involvement and School Achievement: A Longitudinal Path Analysis,” National Head Start Association Dialog 16, no. 1:193–197. Miedel, W. T., and A. J. Reynolds. 1999. “Parent Involvement in Early Intervention for Disadvantaged Children: Does It Matter?” Journal of School Psychology 37: no. 4:379–402. Reynolds, A. J., S.-R. Ou, and J. W. Topitzes. 2004. “Paths of Effects of Early Childhood Intervention on Educational Attainment and Delinquency: A Confirmatory Analysis of the Chicago Child-Parent Centers,” Child Development 75, no. 5:1299–1328. Reynolds, A. J., J. A. Temple, S.-R. Ou, I. A. Arteaga, and B. A. White. 2011. “School-Based Early Childhood Education and Age-28 Well-Being: Effects by Timing, Dosage, and Subgroups,” Science 333, no. 6040:360–364. Reynolds, A. J., J. A. Temple, D. L. Robertson, and E. A. Mann. 2002. “Age 21 Cost-Benefit Analysis of the Title I Chicago Child-Parent Centers,” Educational Evaluation and Policy Analysis 24, no. 4:267–303.